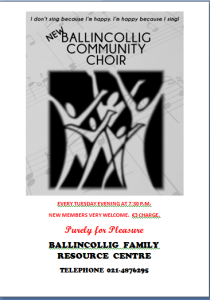 This spring I have started up a lovely new Community Choir together with the Ballincollig Family Resource Centre, Cork. We meet on Tuesday evenings at 7.30pm and are singing a mixture of songs- mostly un accompanied and some with percussion or guitar….. and having alot of fun! !I find this work so enjoyable, and one of the big reasons for me is that it’s so nice to sing and meet with people from such a variety of backgrounds – everyone brings in something very original, and being together brings a great sense of unity within our colourful world. In fact, I think every community should have their own inclusive choir….and I’m happy to be involved in spreading this! !